On June 7, 1964, a driving rain buckled dams and flooded vehicles on the Blackfeet Reservation, sweeping crying children from mothers’ arms, and ferrying homes and bodies across the prairie. Our mobile, documentary narrative tells the story of the worst natural disaster in Montana history: the 1964 flood on the Blackfeet Reservation. 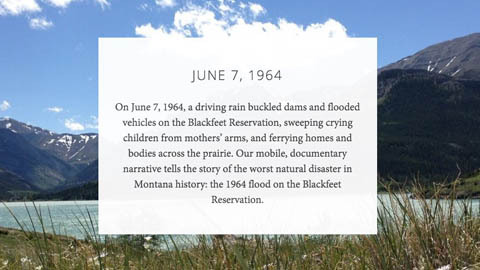 Our mobile, documentary narrative tells the story of the worst natural disaster in Montana history: the 1964 flood on the Blackfeet Reservation. As the 50th anniversary approaches (June 8, 2014), the project provides the opportunity to archive interviews with survivors and tribal leaders, as well as present a mobile narrative of the tragedy that viewers can experience online as well as “in the field” at the site of historic events.